Apple’s iPad: Is it a perfect e-learning tool? Apple’s iPad has been a pathbreaker of sorts in the technological field. They were many naysayers during its launch regarding its utility, but I suppose the tremendous success of the product have shut up their mouths. The craze and euphoria has not died yet, and with the launch of iPad 2, the buzz is getting stronger. And the all-important question comes to the fore: can the iPad serve as an ideal classroom teaching device? I strongly feel that iPad will have a part to do. It is sure to displace one-to-many teaching pedagogies in favor of interactive one-to-one studying and learning and will encourage much more participation from students. To drive home my point about the iPad will have a role in online education for children, here is some news. It has been seen by many that those children who haven’t learned to read or write or even operate a mouse are able to operate the iPad with tremendous speed. According to an article published in Ad Age in June 2010, “How the iPad Became Child’s Play – and Learning Tool,” there were many toddlers as who were as many as 18 months old only who were trying to provoke interaction from TV sets and PC monitors as if they were touch screens like that of the iPad. This indicates clearly that the next generation will find it very easy to respond well and interact with the intuitive device. 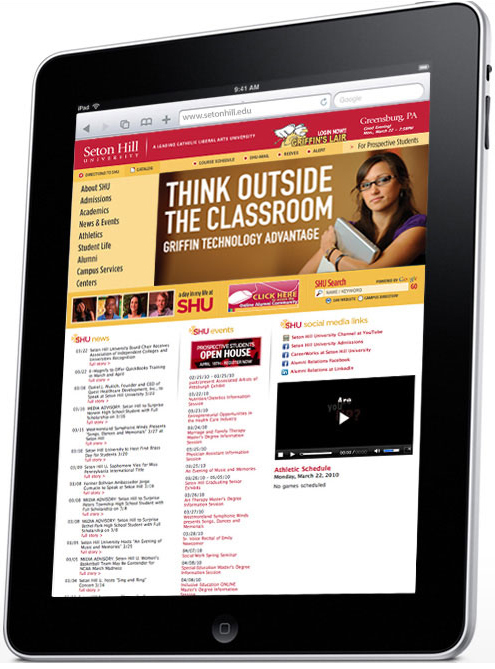 In another study related to e-book reading, a survey result released by Student Monitor revealed that out of 1200 college students who were participants in the survey and interested in e-readers, more than 46% of them opted for iPad as the preferred e-reader rather than 38% of them who favored Amazon’s Kindle. This indicates that iPad is known among the adolescents to be much more conducive and intuitive than the Kindle. Educators today are stressing on the need for contextual learning and user participation. Digital whiteboards have failed to encourage interactivity, and is also less on computing power. The laptop is comparatively bulky too and can be problematic to handle sometimes. The iPad then serves to be the perfect device for comfortable online learning and acts as a useful tool for referencing, collaborating, and content creation. The best part is that of the choice for personalized content for students. Some of the kinks are there: it does not support web pages which have Flash, it does not have a telephone, it does not have a camera and it also does not have USB slots or memory card slots although there is support for dongles. These limitations are somewhat deterrent for its use but once there are updates to the device, I don’t really see a problem for the iPad to be used as a e-learning device! If OSHA Compliance came to your door, what’s one of the first things the inspector might ask to see? The answer is . . . your Hazard Communication Plan. Is your written plan up for that kind of scrutiny? How about your other safety and health plans? Are you sure you have all the required written plans you need in place? When OSHA considers a safety or health hazard to be serious, the agency usually requires written documentation of the steps an employer takes to counteract the hazard. You can see that the above list covers some of the most serious hazards faced by workers today, including, but not limited to, chemical exposures, process explosions, fire, electrocution, and bloodborne pathogens. As an employer, not all of these plans will necessarily be applicable to your workplace, so you’ll want to review the scope and applicability of these regulations to see if your company falls under any of them. For the applicable ones, make sure your written plans meet all the OSHA-required elements specified in the regulations. OSHA has recognized the management and employees of Schneider Electric USA Inc. by naming the company’s facility in Lincoln, Neb. a star site in the Voluntary Protection Programs. Schneider Electric USA manufactures miniature circuit breakers, earned it after a comprehensive on-site evaluation by a team of OSHA safety and health experts. “From the top down, Schneider Electric USA has displayed outstanding effort in implementing a comprehensive safety and health management system,” said Charles E. Adkins, OSHA’s regional administrator in Kansas City, Mo. “The company is an exemplar of workplace safety.” The Lincoln, Nebraska facility employs more than 250 workers, according to OSHA. VPP recognizes sites with effective safety and health management systems for maintaining injury and illness rates below the national Bureau of Labor Statistics averages for their industries. Employers must submit an application to OSHA and undergo the on-site evaluation to be eligible. For information about VPP and other cooperative programs, visit this website.